Help your little ones develop gross motor skills and promote imaginative play with the Skywalker Trampolines 36" Square Interactive Mini Bouncer with Sound! This bouncer features a fun, dog-and-cat-themed jump mat that encourages animal recognition. As your child bounces on an image, the corresponding animal noise will sound. This 36" bouncer includes 32 stretch bands, which are used in place of springs for added protection. A padded handlebar stabilizes the bouncer as kids play, and a soft, padded cover protects your little ones as they climb on and off the trampoline. 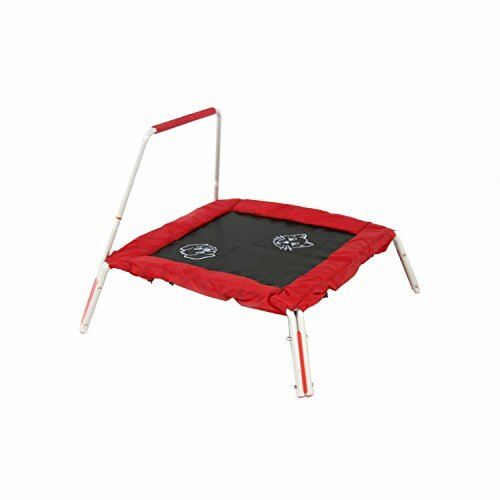 The Skywalker Trampolines 36" Square Interactive Bouncer with Sound is a great way for young bouncers to learn while they play!